It’s always satisfying to find something of value that was lost, particularly when that involves a person’s artistic reputation or life history, and if there’s a theme running through this issue it’s certainly one of rediscovery and reassessment. While we can’t take the credit for the legwork and detailed research that has gone into this, we can give due admiration to those who are willing to put in the effort to uncover the true facts about an artist’s life and work – and, in some cases, their death. 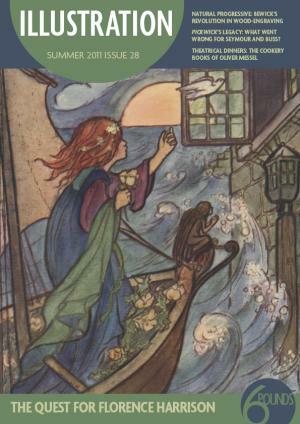 In this issue we cover all these areas: we find out that the much-loved Pre-Raphaelite illustrator formerly known as Florence Harrison, was not in fact the true Florence Harrison at all and get the facts to set the record straight, before going on the trail of two of the earliest illustrators involved in the Pickwick Papers, Robert Seymour and Robert William Buss, and learning the strange fate of, and stranger rehabilitation of, Seymour’s tombstone. Less detective work is needed to learn about the work of Thomas Bewick – his fame during his own lifetime and the fact that he left his own Memoir have kept his reputation alive – but that doesn’t mean there’s nothing left to say about his art, which is why we welcomed the chance to explore a new, comprehensive book on Bewick’s wood-engravings that includes much that is new or in need of re-assessment. And, while Oliver Messel’s reputation for his theatre and costume design is in no danger of fading, we learn more about why he should also be remembered for his few, but distinctive, book illustrations. Moving on from the reputations of artists, we shift focus to admire a book intended to commemorate an entire endangered language, way of life and environment, when we travel through an alphabet inspired by a printmaker’s residency in Greenland. So raise a glass to those who keep these flames alight and enjoy the fruits of their labours.